Recent release “No One Is Invincible,” from Page Publishing author Shawn Walker, is a gripping, coming of age novel in which a runaway teenage boy who quickly becomes jaded by the moral corruption of the world around him and finds that his only solace which resides in a dearly loved one is being threatened by a dark and unbiased killer: cancer. 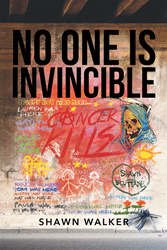 Shawn Walker, a writer and punk rock musician and enthusiast, has completed his new book “No One Is Invincible”: a heartfelt novel that follows the main character John as he faces down not only homelessness but also the fear of losing a loved one to a very deadly killing agent: cancer. Published by New York City-based Page Publishing, Shawn Walker’s tale follows punk rocker John as the loneliness of growing up in a home filled with domestic violence pushes him into running away. Now homeless and living on the streets, the sixteen year old finds his intelligence no match for the hunger, horrid winter weather, and human ignorance he finds to be part of his new existence. John struggles to find morality in the world around him until he finds help in the love of a mysterious old lady who goes by “Mom.” Mom and a charismatic six-year-old girl named Candy show him light can be found in the darkest of places. Readers who wish to experience this inspiring work can purchase “No One Is Invincible” at bookstores everywhere, or online at the Apple iTunes store, Amazon, Google Play or Barnes and Noble.